Despite being 856 years old, there are many more modern aspects, like the spire that no longer exists. It was designed by Eugene Emmanuel Viollet Le Duc in the early 1800s which is over 93 metres tall and surrounded by copper statues of the 12 apostles. 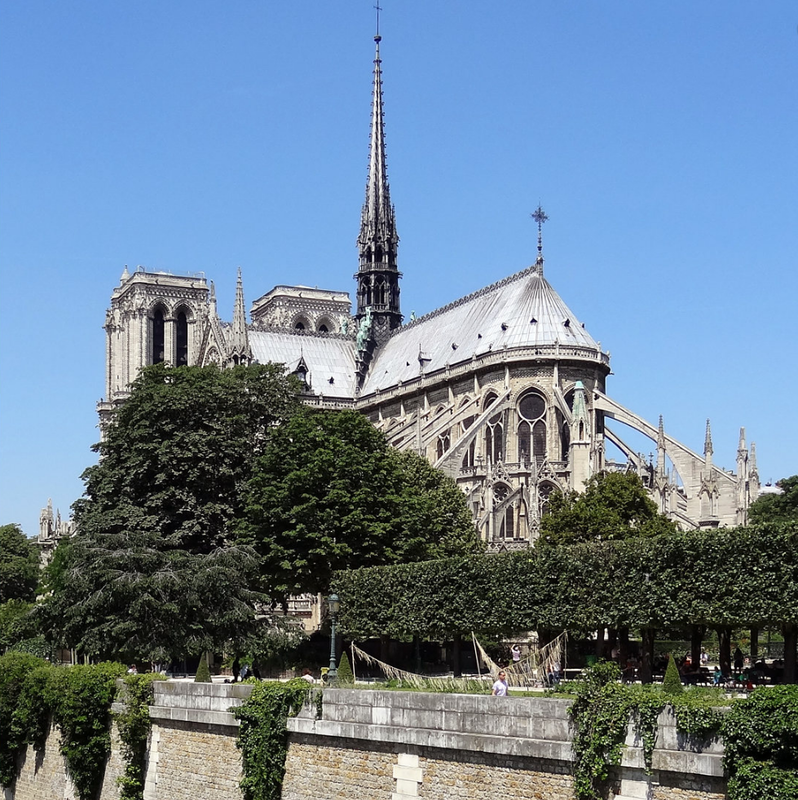 GUEST BLOG / By Staff of EUTouring.com-- The French Gothic Notre Dame de Paris is located on the Ile de la Cite island in the middle of the River Seine in Paris. Yesterday, the massive Cathedral was scarred with a fire of undetermined origin, which collapsed an iconic spire and much of the roof. Much was lost, but thankfully much was saved. Notre Dame Cathedral is now 856 years old. The original name for Paris was Lutetia or Lutetium and was first evangelized in the 3rd century when the Pope sent the first bishop to Paris in around the year 250, where he became Saint-Denis, the Patron Saint of the city. At that time, people had to practice their faith in secret, however, he was martyred a few years later in the area of Paris on the highest point, which is now known as Montmartre and the successors lived in hiding until Emperor Constantine declared peace with the church in the early 300s. From this time it was then possible to build Christian edifices, but the information on what was built at this time is still very sketchy even though many excavations and archaeological digs have been conducted over the years. After several different excavations being undertaken on the Ile de la Cite, archaeologists believe that there was originally a pagan temple that was replaced by a large Christian basilica which had five naves. And through major research it was found that the original basilica was dedicated to Saint Stephen, however, it still has not been determined as to whether this was originally built in the 4th century and renovated, or whether it was built in the 7th century utilizing many of the older materials and elements of construction. Yet there are a few facts that have been clarified, such as the size of the building dedicated to Saint Stephen, with the Western facade being located around 40 metres away from the current facade of the Notre Dame Cathedral, and the naves were separated by marble columns and walls were decorated with mosaics. But it was in the 12th century when King Louis VII was in power, that he, the Bishop of Paris, Maurice de Sully, and the Chapter made the decision to build a new cathedral in place of the Saint Stephen church, which would be far larger due to new architectural techniques and in the Gothic style. During the reigns of King Philip I, King Louis VI and then King Louis VII, Paris was developing into a major economic center. Maurice de Sully, who was the Bishop of Paris from 1160 through to 1196 was a major influence in the reconstruction of the Ile de la Cite at this time, which meant far more than just the demolition of the Saint Stephens Cathedral. The creation of a square, or Parvis as it is known, due to the fact that it would serve as an intermediary between the secular and the sacred world was created along with a vast six metre wide street named Rue Neuve-Notre-Dame, which would provide the ever growing population with easy access to the cathedral. Tradition has it that the first stone of the new Notre Dame Cathedral in Paris was laid in 1163 in the presence of Pope Alexander III. However, there are many different accounts as to who actually laid the first stone, whether it was the Bishop of Paris, or not and even today, this is one fact about the history of the Notre Dame Cathedral that has remained unproven. The original plans from an anonymous builder, which again, no historians can identify at present, were to construct the Notre Dame de Paris Cathedral in the same style of layout which had been previously used for the Saint Stephen Cathedral. And this would be a double-sided aisle plan without a salient transept and would be four stories high with tribunes. But these original plans were not adhered to and the construction of the Notre Dame Cathedral was changed and improved over many years before its final completion and so the history of the Notre Dame de Paris continues. There were four major construction campaigns during the late 12th century and the start of the 13th century, with the first being the construction of the choir and its double ambulatory that are like aisles behind the altar, which took place during the years 1163 through to 1182. And the choir's high altar was dedicated on 19th May 1182 by Henri de Chateau-Marcay who was the Papal Legat and assisted by Maurice de Sully. From 1182 through to 1190 the last three bays in the nave along with side aisles and the tribunes were constructed by the second builder on the site, and then the third builder took over. The two towers on the Western facade, the upper gallery and the modification and expansion of the upper windows and the fitting of the nave side chapels between the flying buttress abutments were constructed by the fourth builder during the years 1225 through to 1250. The North Tower was completed in 1240 and the South Tower was completed in 1250. 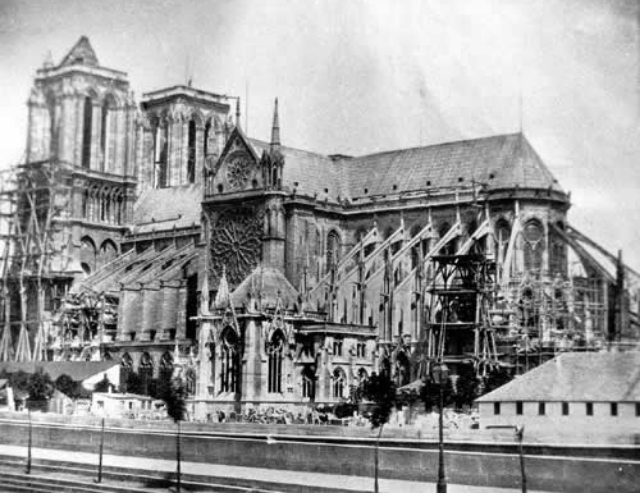 It is noteworthy that the original plans were not utilizing the flying buttress arched supports, however, because the walls were thinner than in previous constructions in the past and the Notre Dame Cathedral was far taller, it was realized that extra supports were required. Stress fractures started to appear as the walls pushed outward, so hence why the flying buttress design was incorporated by building supports around the outside walls, and this was one of the first buildings in the world to utilize a flying buttress design. Expansion of the transept arms with the North counter-brace including the Cloister portal and the north Rose window was started in the late 13th century, along with the South Counterbrace of the Saint-Etienne portal and the south Rose window. The North Rose Window (above) was the first window to be constructed in the year 1250, then in the year 1258 the first stone was laid on the south transept facade under the guidance of a master mason, sculptor, and architect Jean de Chelles, and this is when Notre Dames South Rose Window was started in 1258, which measured a staggering 13.1m in diameter and had a total height of the almost 19m including the bay, with the same dimensions as the North Rose Window, making these the largest stained glass windows ever produced at that time. On the western facade under the balustrade, there is a large horizontal frieze, the Gallery of Kings, with 28 different statues, which was completed around 1284 and these were also painted. And it is known as the Gallery of Kings as these statues were presented that way, which is why over the years, they have been attacked numerous times, especially during the French Revolution. Also at this period in time and up until the early part of the 14th century, the choir chapels and the apse between the buttresses and the installation were built, and with the success of the early flying buttress construction, there were large flying buttresses incorporated in the choir, plus the 15 metre apse was constructed. But in addition to these, the tribune, which is part of the apse of the Notre Dame Cathedral that is designed to hold the Bishops throne, was also erected along with sculpted, stone screen around the choir and the sanctuary. When the Sanctuary was completed with an altar, it was dedicated to the Virgin Mary, and it still stands in the same spot today, but the first spire that was built at the transept crossing around the year 1250, which was a bell tower, was taken down around the late 1780s. Notre Dame de Paris was finally completed in the year 1345. However, the history of the Notre Dame de Paris Cathedral does not stop there, as there were modifications made during the 17th and 18th century such as the refurbishment of the sanctuary and choir, which was led by Robert de Cotte in order to fulfill a vow made by King Louis XIII. 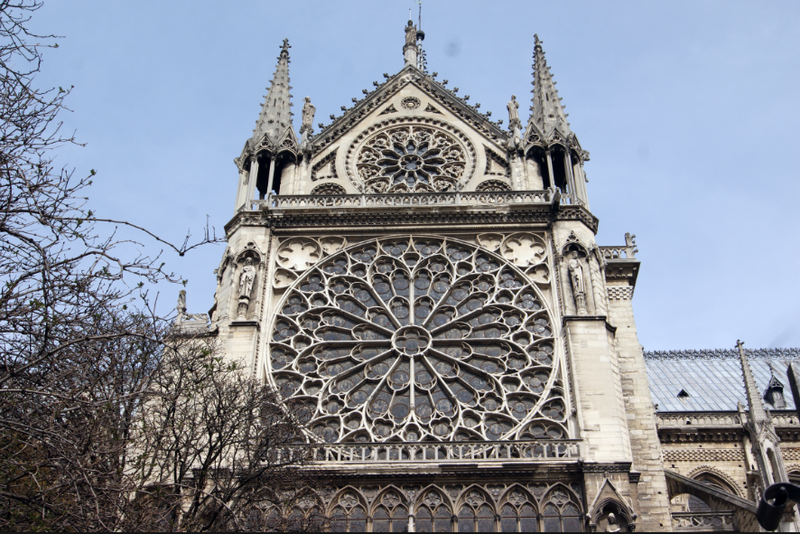 The South Rose window was restored, but many 12th and 13th-century stained glass windows were replaced with white windows and the central portal was also refurbished by Jacques-Germain Soufflot who designed The Pantheon in Paris. And yet, just like many historical buildings in Paris, unfortunately, the French Revolution took its toll on the Notre Dame Cathedral and many different aspects of the cathedral were destroyed. All of the bells of Notre Dame de Paris except for the Emmanuel bell, the 28 statues from the Gallery of Kings along with the major portal statues were all destroyed except for the Virgin from the Cloister portal trumeau. But through a treaty with Napoleon Bonaparte I, known as the 1801 Concordat that defined the status of the Roman Catholic church in France, the Notre Dame Cathedral now had a new lease of life and the famous Crown of Thorns along with other relics were placed within the Treasury, which is where they remain today. A few years later, Victor Hugo published a book called The Hunchback of Notre Dame and this made the cathedral more famous, yet it was in need of major restoration work. So, in 1844 King Louis Philippe I along with the government came to an agreement in which to restore the cathedral in all its glory and the project was commissioned to the architects Eugene Viollet-le-Duc and Jean-Baptiste Lassus. But after Jean Baptiste Lassus died, Eugene Viollet-le-Duc took over the whole building project. Some of the massive projects undertaken to restore the Notre Dame de Paris included the reconstruction of the spire, construction of a new sacristy, the restoration of sculptures and installation of new windows. The central portal was refurbished, a complete repair of the Great Organ took place, plus there were wall paintings added in the side chapels, and on 31st May 1864 the cathedral was dedicated by the Archbishop of Paris. With a lot of luck the Notre Dame Cathedral survived through World War I and World War II and after lengthy debates that had taken place over the course of many years, it was decided in 1965 that the 19th century windows of the nave would be replaced with colored windows, like they were originally in the 12th and 13th century, and it was the master glassworker Jacques Le Chevallier who was given the task of restoring these windows. Then during the 20th century, the Great Organ became one of the most famous organs in the world, and between the years 1990 and 1992, this went through major restoration by a French firm of organ builders. From the same time, a major cleaning program of the Western facade took place and lasted ten years, so by the year 2000 anyone coming on holiday to Paris could admire the splendor of the medieval architecture. In addition to this, the clergy had refurbished the liturgical platform several times and in 2004 this also included the recreation of a passage between the two transepts, and this area was also rearranged in order to bring the choir and the nave together so that they can operate together during major celebrations. And the latest and most recent renovation comes in the form of new bells that are being produced including a new Grand Bell which will be placed in the South Tower alongside the famous Emmanuel Bell, marking the 850 anniversary of the Notre Dame Cathedral in 2013. Now, with the tragic fire still burning, France will soon embark on restoring Notre Dame de Paris. The day of its completed restoration will be a holiday like no other. BEFORE THE SPIRE. From 1844 to 1864, a major restoration project was undertaken and supervised by architect/historian Eugène Viollet-le-Duc, who added the cathedral's iconic spire.